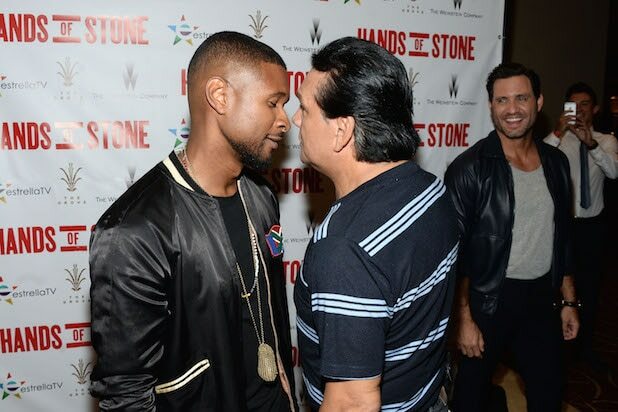 Usher and retired boxing legend Roberto Duran faked a staredown at a special screening of The Weinstein's "Hands of Stone" at the Grove in Los Angeles on Monday night. Top Party of the Week: RatPac, Brett Ratner, and David Raymond hosted an event for U.N. Secretary-General Ban Ki-Moon at the Hillhaven Lodge in Beverly Hills. Ratner is launching an entertainment related initiative with the U.N. called "In Harm's Way." 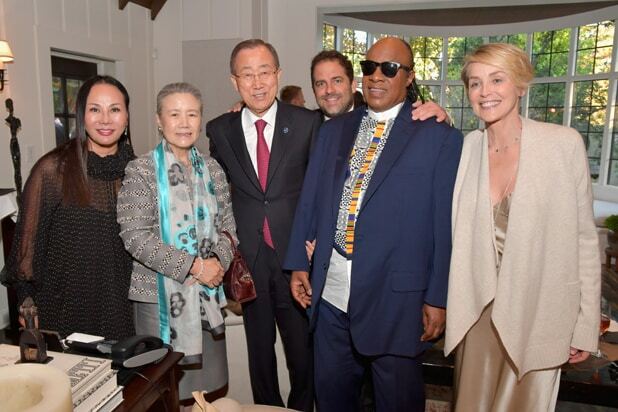 Eva Chow, Yoo Soon-taek, Stevie Wonder and Sharon Stone also attended the Aug. 10 launch event. Nuclear physicist Taylor Wilson, Dakota Johnson, Mariah Carey, Ratner, and Naomi Campbell huddle up with the United Nations. Lee Daniels and Courtney Love made the scene for Ratner and James Packer's event. When traditional and new media stars mix and mingle, the digital bosses like Cameron Dallas (far left) and Bethany Mota (second from left) stood out from the crowd led by Elle Fanning (center), Jaden Smith, and Ansel Elgort at Variety's Power of Young Hollywood event at Neuehouse in Hollywood on August 17. Out of the rotation due to injury, L.A. baseball star Clayton Kershaw threw a ping pong fundraiser at Dodger Stadium instead, raising $500,000 for his foundation. Drawing from across the glamour industries, Diplo, Dodger centerfielder Joc Pederson, second baseman Howie Kendrick and L.A. Clippers point guard Austin Rivers grabbed paddles. Will Ferrell hosted the Kershaw event, doubling up with pitcher Kenton Maeda. Pharrell Williams would be a cool substitute teacher. The fashion maestro is mixing his "i am OTHER" brand with Yoobi for a collection raising money for youth classrooms. Johnny Galecki, ZZ Top's Billy Gibbons, and gallery owner Timothy White unveiled a sleek photography exhibit of celebrities and cars at the Sunset Marquis in West Hollywood. Dubbed "Cars and Stars," it features pics like this: Bruce Springsteen with his 1960 Corvette in Haddonfield, New Jersey, photographed in 1978. Here's Keith Richards with a non-DMV-recommended motorist beverage. This was not Billy Gibbons' first time at the Sunset Marquis. This pic is part of the collection, on display at the Morrison Hotel Gallery inside the Sunset Marquis through Aug. 21. Beauty influencers gathered at the the 5th Annual NYX FACE Awards on Saturday, August 20. Here, Charisma Star (Charis Lincoln, 768k Youtube subscribers) speaks from the crowd as makeup personality Patrick Starrr (2.4 million followers) looks on. The Television Critics Association wrapped up this week with a series of parties. Here, CW talent Peyton List, Tori Anderson, Gina Rodriguez, CW President Mark Pedowitz and Rachel Bloom basking in flashbulbs at the Pacific Design Center. The Pacific Design Center bash in West Hollywood was a joint affair for corporate cousins CBS, Showtime and The CW. Spanning multiple decades on TV, 1990's mainstays Kevin Nealon and Matt LeBlanc are still churning out good work. Freddy Rodriguez, Dermot Mulroney, Adam Rodriguez, Luis Guzman, Wilmer Valderama and Finesse Mitchell at the TCA bash on Wednesday, Aug. 10. "Summer loving ... had me a blast" - Rosie O'Donnell and Ed Asner at Asner's poker tournament for Autism Speaks in a downtown L.A. penthouse. Next big thing Stanaj packed The Sayer's Club full in Hollywood at 7:45 p.m. on a Wednesday for a showcase tied to the release of his EP, "The Preview." The singer, supported by Drake and Jay Z and signed to Republic, had luminaries Randy Jackson, Jason Flom, Avery Lipman, and SBE founder Sam Nazarian nodding along to "Sleep Alone," our pick for the breakout hit. Sarah Hyland sang at a Glamour Magazine dinner at La Poubelle hosted by West Coast Editor Jessica Kantor on Wednesday, Aug. 10. Get used to seeing these Oscar contenders: Sundance 2016 winner Nate Parker (far right) accepted the Vanguard Award from the Sundance Institute on the eve of the annual "Sundance Next" festival in L.A. Cast members Jason Stuart and Armie Hammer (far left) were on hand at the Ace Hotel as the writer-director-actor accepted the award and announced "The Birth of a Nation Fellowship" for 18-to-24-year-old filmmakers. What a Sundance party looks like in the dead of summer in downtown L.A. The scene at the Ace Hotel looks nothing like the hats, scarf and parka stuffed affairs on Main Street in Park City each January.